Looking for the best places to eat on one of Toronto’s most dynamic streets? Our guide to Ossington restaurants showcases the best bites found on the strip — be it at a French bistro, local brewery or ice cream sandwich shop. Transitioning from a gritty past to a happening dining destination, Ossington Avenue is one of Toronto’s most noteworthy streets. Most of the focus rests on the strip reaching from Queen Street up to Dundas, which is dominated by a clutch of innovative Ossington restaurants. It’s here that everything from Malaysian to Greek cuisine is on offer to Torontonians in possession of ever more knowledgeable palates. Ossington Avenue grabs its name from an English village. From the late 1800s onwards, Ossington south of what’s currently known as Dundas was, in fact, called Dundas. Around 1910 it became Ossington and has had many rebirths over the years. It used to be one of the city’s main stockyard areas, later transitioning into a mixed residential and industrial zone thanks to the addition of a streetcar stop in 1861. Many an automotive shop peppered the streetscape. It’s also played a big role in certain immigrant communities, including Ukrainian, Italian, Portuguese and Vietnamese. Despite the many changes to the strip, one constant is the mental health institution at the base of the street. Originally know as the Provincial Lunatic Asylum when it was built back in 1850, its moniker has shape-shifted with the changing of the times. Now it’s known as CAMH, or the Centre for Addiction and Mental Health. By the mid-2000s, the neighbourhood had become a pretty ho-hum one, with less-than-savoury businesses dotting the landscape (think karaoke bars that are more brothel and less singing). But as restaurateurs sought out affordable rent, the atmosphere changed. The glut of late night locales that set up camp resulted in plenty of street-side debauchery — so much so that in 2009, a moratorium was put in place. Since then things have cooled just the right amount, transitioning into hipster catnip and one of Toronto’s glossiest nabes. In March of 1966, Muhammed Ali trained at a gym above an autobody shop at 109 Ossington Ave. in advance of his fight with George Chuvalo at the Maple Leaf Gardens. Ali won. A heritage plaque now marks the spot. A less celebrated and far more notorious resident of Ossington was James Earl Ray. After murdering Dr. Martin Luther King Junior in 1968, he hoofed it up to Canada to hide from the FBI in the area’s rooming houses. Eventually he was caught in at London Heathrow Airport with a fake Canadian passport. Once considered by Torontonians to be rather far in the outfield, Ossington Avenue has since become a proper destination that’s worth devoting at least an afternoon to. In addition to its stellar food scene, the strip is home to shops like the quirky Victoire, which highlights Canadian labels, and I Miss You Vintage, a designer resale boutique with exquisite threads. The Lower Ossington Theatre draws wannabe thespians through its doors with its top tier musical productions. Ossington can be accessed easily by TTC or vehicle. Those taking the 501 Queen streetcar will exit at the Ossington stop; anyone arriving from the Bloor–Danforth subway route will get off at Ossington station and take the 63 Ossington bus south. Drivers can find parking at the Green P on Ossington Avenue just slightly north of Queen Street; another lot is located at 1117 Dundas St. W., just east of Ossington. Additionally, there’s a Bike Share station at 455 Ossington Ave. or plenty of street posts for cyclists arriving on their own bicyclettes. Expanding from Portuguese bakeries and Vietnamese restaurants to more diverse offerings, Ossington restaurants now count a Malaysian bistro, ice cream parlour and brewery amongst its ilk. Ossington Restaurants: Bellwoods Brewery is the only craft brewery on Ossington Avenue. Bellwoods Brewery is one of the top Ossington restaurants and simultaneously one of Toronto’s craft beer success stories. The brewpub came about when owners Mike Clark and Luke Pestl decided to give it a go on their own after working together at a local brewery. The duo nabbed a former gallery space on Ossington that had great bones, the potential for a large patio and a dreamboat of a location. Come spring of 2012, Bellwoods Brewery was ready to open, with subsequent leases allowing them to grab more space the following year. Now, the pub and brewhouse sit at one address, with the retail shop and kitchen perched next door. Undoubtedly the shop allows customers to grab bottles for sipping from at the namesake park nearby. Chef Jay Browne has been holding down the kitchen fort since the brewery rang in its second year (though he jokes that the fries have been paying the bills since day one). His menu puts the onus on seasonality — sourcing from local Canadian suppliers — and affordability. Dishes like the light, bright and tangy pickles or the house-made sausage are ideal for beer-in-hand snacking. 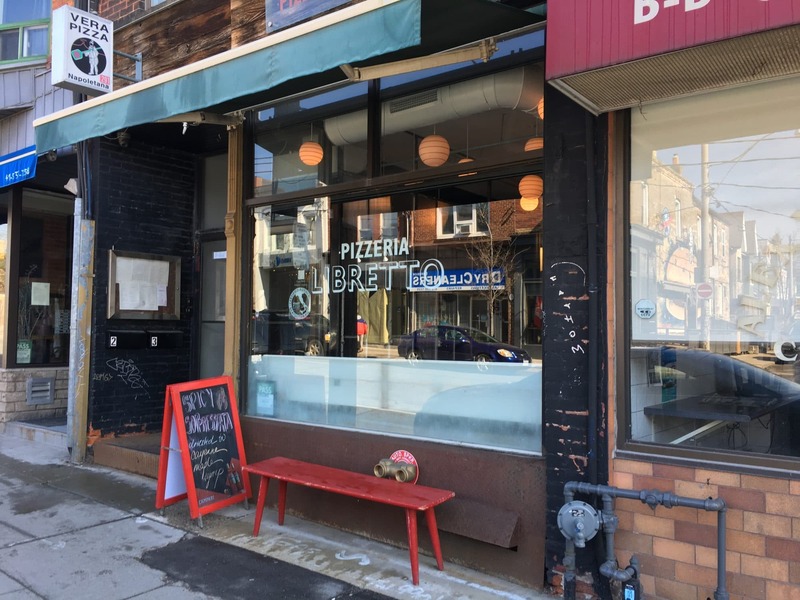 Ossington Restaurants: Pizzeria Libretto is the neighbourhoods OG pizza place. Trying to recall a time before Torontonians were besotted with Neapolitan pizza is a foolish game. Pretty much all of the obsessiveness surrounding the pies can be traced back to Pizzeria Libretto, one of the Ossington restaurants with the most longevity. Restaurateur Max Rimaldi opened the mothership back in 2008, which has since seen a number of siblings open — and a couple close — across town. Chef Rocco Agostino plays executive chef and partner. In the early days, queues were forever snaking out the door, with reservations forbidden. Later delivery and resos were deemed doable, helping to sate the cravings Torontonians felt for the pizza. The menu is classic Italian fare, skipping from antipasto to assaggini to pasta and yes, the pizza. To start, sharables include the ricotta gnohcci fritti and the arancini with smoked scarmorza and stracciatella. Pasta might be a swirl of linguine in simple tomato sauce. But the focus is the pizza. Adhering to the Napoli styles dictates — the Associazione Verace Pizza Napoletana — the pizza is built using double 00 flour, San Marzano tomatoes, fior di latte mozzarella and parmigiano reggiano. Blistered pies with thin-yet-chewy crusts emerge from the 850F oven after 90 seconds, spanning 12” in diameter. Options include a Margherita with fresh whole burrata, or the Melanzane with eggplant and whipped ricotta. A duck confit pie with bosc pear and mozza is one of the bianca options, as in another with house-made sausage and caramelized onion and chili oil. Vegans, GMO avoiders and those with celiac disease can all dine here with ease. And, there’s a noteworthy tiramisu for dessert. Ossington Restaurants: Bang Bang’s ice cream sandwiches go above and beyond. Once upon a time, Toronto wasn’t privy to the charms of the ice cream sandwich. Then Bang Bang swung open its doors as one of the latest Ossington restaurants in 2014, foodies caught wind and queues begun snaking down the street at the first whiff of warm weather (and during cooler temps too, if we’re honest). Flip through a handful of years, and the lines haven’t abated. Bang Bang Ice Cream is the work of baker Roselle Pezzelli, who first made her name in town with her Bakerbots Baking. “My first bakery was serving up some of Toronto’s first and finest ice cream sammies back in 2011,” Pezzelli notes. “We outgrew that space quickly and happened to come up upon an empty storefront at 93a Ossington. The neighbourhood had great energy; it was an eclectic mix of immigrants, students, rundown auto body shops, metalworkers, mom ‘n’ pop businesses and artists’ studios.” The fact that Pezzelli was already pals with the folks from Bellwoods Brewery and Union Restaurant helped cement her decision. When it comes to the menu, the small batch ice cream comes in so many flavour choices, it’s a blessing the line-up’s a long one. Pezzelli, who notes she’s a “bit obsessive,” makes fresh batches daily using sustainable ingredients and has fun exploring good food and flavours. “I love our basics — simple is truly best to showcase ingredients — but do enjoy throwing a wrench into the mix to see what will happen,” she says. There are collaborations with neighbours and the team makes what they want to eat. Options like Cinnamon Toast, Avocado and Fig and Chevre speak to food snobs and gluttons alike and are ready to be parcelled into scrumptious cookies like RoCocoa (deep, dark and delicious) or date and raisin-spiked Oatmeal. Safe types can use the already-approved flavour combos as guidance, though DIY sammies are encouraged. Keep in mind that there’s no inside seating to be had, so these ice creams are made for walking. 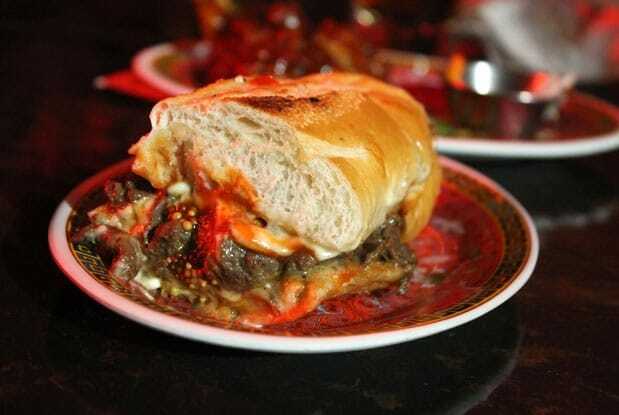 Ossington Restaurants: Oddseoul’s bulgogi cheesesteak is a winning mash-up. Oddseoul is the type of place that one could pass by many times and not be the least clued-in to its presence. No hanging sign is to be found out front; instead, look atop the mailbox. But squeeze inside and the darkened room instantly conjures up cool. Inside, the vibe is industrial and patrons sit along the front bar or (mostly) at high top tables in the back. The work of brothers Leemo and Leeto Han, Oddseoul was one of the ringleaders of the Ossington restaurants scene, jumping aboard the restaurant strip back in 2012. Word got around town that their modernized Korean food was easy to scarf against a backdrop of soju-spiked drinks and hip-hop beats. The Loosey sandwich — a Korean take on the Big Mac — helped cement the Oddseoul name onto the lips of foodies. While other sibling restaurants — Pinky’s Ca Phe, Seoul Shakers, Hanmoto — have opened shop in other regions of Toronto, this Ossington restaurant is the original. 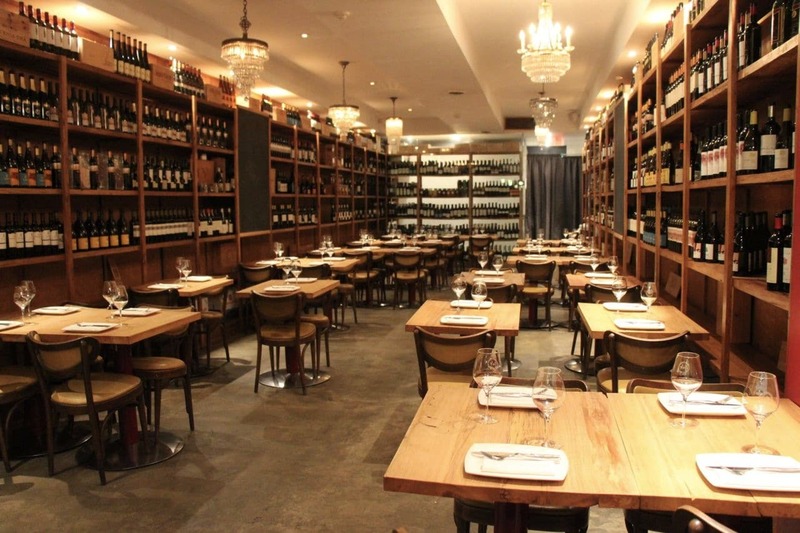 Ossington Restaurants: The artful backdrop at La Banane complements the French bistro fare. If there’s one of the Ossington restaurants that’s garnered plenty of ink since opening, it’s La Banane. Chef Brandon Olsen had already made a name for himself in Toronto’s food scene thanks to his way with fried chicken and chocolate. He was was keen to open his take on a French restaurant with partner Sarah Keenlyside who deals in all things visual. As luck would have it, the duo managed to nab an Ossington space and work some magic. “There really is no better street in Toronto to put a restaurant,” chef Olsen says. “Ossington is home to a surprising number of truly great restaurants and people throughout Toronto and beyond regard Ossington as a foodie destination.” Guests step through a cheery yellow door and into a breathtaking bistro space, with rich leather banquettes sat against a backdrop of all shades of greens and gilded touches throughout. And there is art. How would one describe the La Banane menu? “French classic-inspired dishes with a few surprising twists,” Olsen says. Think seared foie, a proper omelette and a tenderloin steak au poivre, with sightings of chef’s famed fried chicken and dazzling chocolate desserts for good measure. There is also a great focus on seafood, with a series of eye-catching towers always being a draw for patrons (even the mini-est platter offers plenty of bang for your buck). 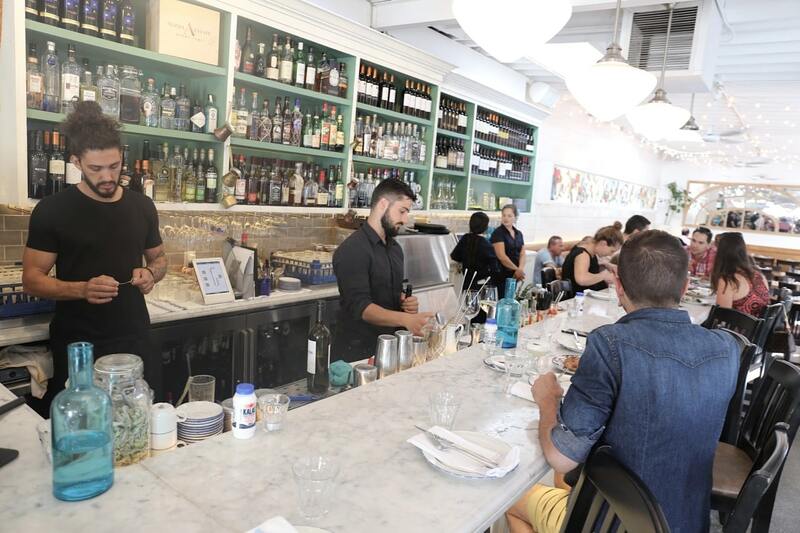 Ossington Restaurants: Mamakas Taverna is one of Toronto’s best Greek restaurants. At Mamakas Taverna, owner Thanos Tripi spins out classic Greek fare in a thoroughly modern space. Newish to the strip, this is one of the Ossington restaurants that has been a sought-after dining location since day one — perhaps in part due to the dearth of Aegean eateries in this neck of Toronto. Inside, the elongated room paints a modern picture of Greece, with pops of sea-washed green and ocean blue accenting the bright whites. Tripi looked to his grandmother’s recipes when building the Mamakas menu. Unsurprisingly, these dishes are made to share; the more dinner guests, the more sampling to be done. “We pay a lot of attention to what we’re using, as Greek food is super simple,” Trini says. “We source the best.” Much of the ingredients are flown in from Greece: cheeses, fish, olive oil, olives… The meat is all sourced locally and is high quality. Plates range from the familiar (spanakopita! cheese saganaki! melitzanosalata!) to less charted territory (lamb tartare and tea-brined chicken). The focus on Greek product extends to the beverage menu; wine and beer options are exclusively Greek, while Roots spirits are used in the house cocktails. Authenticity is key. Santorini Assyrtiko white wine — “It’s very very popular within the wine world,” says Tripi. Ossington Restaurants: Soos Toronto serves the city’s favourite Malaysian dishes. 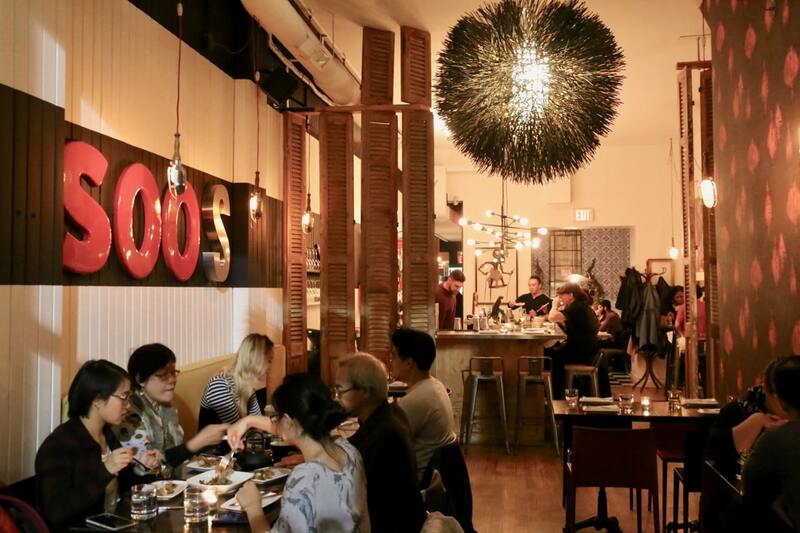 Way back in 2013, Soos Toronto tiptoed its way onto the strip of Ossington restaurants. Malaysian cuisine isn’t found half as easily as, say, Thai food in the city and Soos is a premiere destination for the fare. Inside, the space is lively, with design touches including checkerboard flooring, batik puppets and wooden shutters, pulling inspiration from the country’s vibrant past. Chef uses a modern lens to interpret Malay cuisine for Torontonians, offering ready-to-share street food-style eats. Over the years, Malaysia has been occupied by a clutch of countries, and those cultural influences are reflected in the cuisine. Flavours from China, Indonesia, Portugal and more can be found threaded through the cuisine. As of late, the Ossington restaurant has placed a greater focus on vegetarian and vegan fare. “We have increased our focus on plant-based options, which have been a hit with our diners!” Soo says. 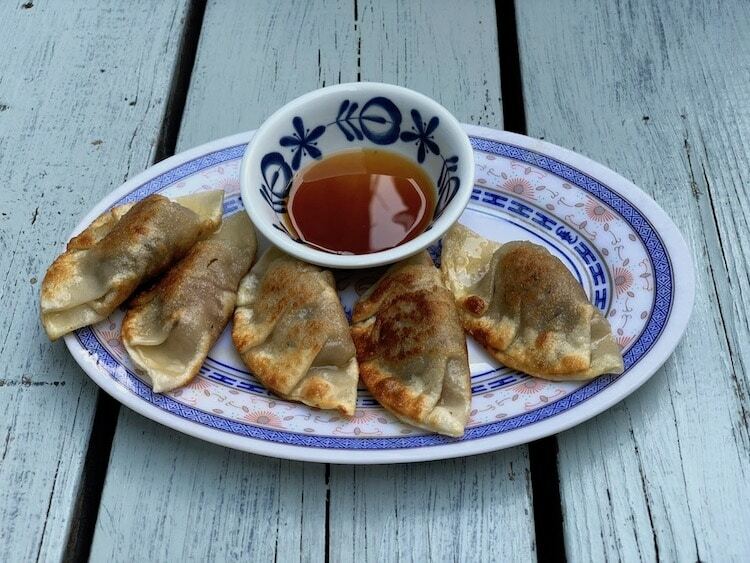 “Our favourite plant-based dishes are the Murtabak and the Shroom Braise.” In additionally, the team has opened a plant-based pop-up concept called Fat Choi on Mondays and Tuesdays. “We are so happy to have had the privilege to call this neighbourhood home!” Soo says. Restaurants Cava and Chabrol have been making their mark on the Toronto restaurant scene for years. So when the seasoned restaurateurs behind the spots — chef Doug Penfold and Niall McCotter — decided to add Tanto to the row of Ossington restaurants, the excitement was palpable. Opening shop under the Peer to Peer Hospitality Group moniker (with Khash Khavari making three owners), the team brought their chef de cuisine from Cava — Julian Iliopoulos — along for the ride. The young chef gained exposure to exciting new cuisines while travelling, and couldn’t help but tuck them into his personal cuisine. “He was truly inspired by the people, food, and energy of Argentina and wanted to deliver his interpretation of that in Toronto,” says McCotter of chef Iliopoulos. “Our philosophy is to give guests a thoughtful dining experience built on flavours and ideas inspired by Argentina, Spain, and the Mediterranean,” McCotter says. A rotating menu reflects their seasonal interests, while spotlighting on what they consider to be extraordinary ingredients. “The menu is constructed to encourage the conviviality of shared dining with thoughtful small plates and more substantial grilled meat platters,” he says. When it comes to drinks, up-and-coming sommelier Madeleine Hayles takes care of things. The wine list looks to Italy, France and Spain, paying tribute to mostly old world, small houses that have a very hands-on approach. In terms of cocktails, tipples might include the Oro y Sangre: Té Bheag Scotch, Amaro Montenegro, Cynar, fresh OJ and a touch of Crème de Cassis. Ossington Restaurants: Foxley Toronto is famous for its Pan-Asian fare. 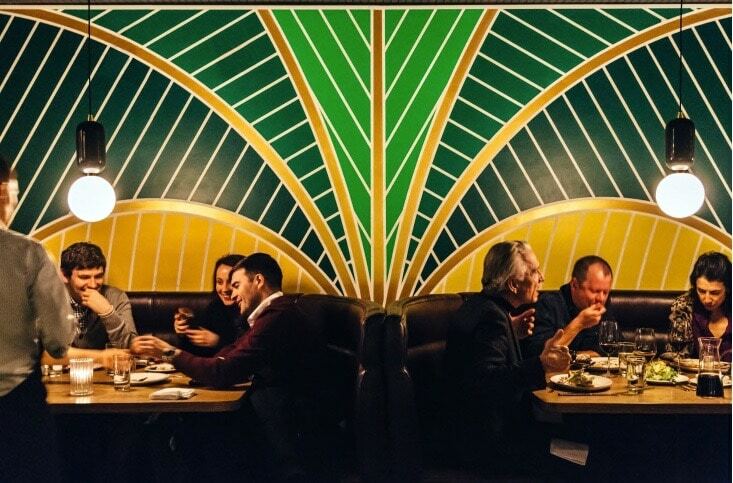 Foxley is one of the eateries that truly paved the way for the current vibrant map of Ossington restaurants. Back in 2006, resto veteran Tom Thai — known for intro’ing the sushi program at Canoe — was keen to open his own space. In those days, the Ossington strip contained a smattering of bars, auto shops, Vietnamese restaurants and karaoke joints. Thai saw the street as a unique opportunity to create a community alongside the other businesses. Now, over a decade in, Foxley is a linchpin of the nabe, spinning out Pan-Asian fare and known most famously for its ceviche. Thai sums up his culinary philosophy simply: “Good value, big flavours.” In addition to playing both chef and owner, Thai designed the restaurant interior, which boasts a neighbourhood bistro atmosphere. The beverage program sees chef Thai and his staff delivering an extensive and rotating wine list in addition to local craft beers and ciders. They pour one featured cocktail — a gin, Aperol and grapefruit spritz. Ossington Restaurants: Salt Wine Bar offers dishes from Spain and Portugal. Of all the Ossington restaurants, Salt Wine Bar is the one that uses wine as its raison d’être. Part of the coterie of wine bars that have hopped onto the Toronto scene, this bustling space is one of the oldest, around since 2010. After losing rent money by the month following a restaurant and bar moratorium on the strip, owner Albino Silva optioned to open with a catering license. Fast-forward almost a decade, a closure and a re-opening, and things have turned out well. 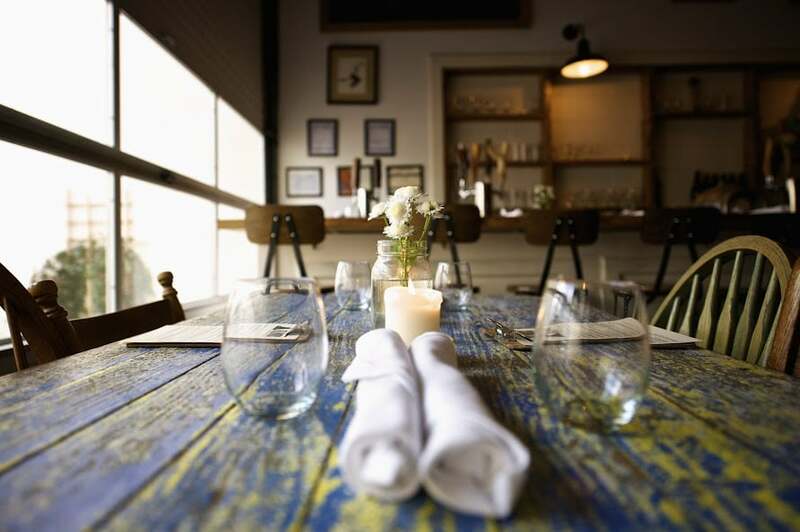 Inside, Salt Wine Bar is fit with communal tables and ambient lighting, lending it a cozy atmosphere. Patrons gobble Iberian tapas down, with the menu aiming to be local and seasonal whenever possible. The goal is to transport diners to the Iberian peninsula. Think: Bites like jamón ibérico aged 36 months, foie gras and chicken liver pate, and grilled sardines on toasted sourdough. Heftier options might include grilled octopus studded with chorizo ibérico or risotto negra with grilled calamari swimming in squid ink lobster broth. With regard to the wine, their unique list is exclusively Iberian. Counting around 200 wines on the list, there is a special focus on Vinho Verde — a very misunderstood region in Canada — Port wines and Madeira wines. Their inventory totals about 2500 bottles. Soalheiro Alvarinho — Located in The Vinho Verde region of Portugal, Soalheiro focuses almost exclusively on Alvarinho and have now started to produce a red and rose wine that are true to the region. Niepoort Charme — Niepoort is located in the Douro Valley in Portugal and has been family owned and operated since 1842. Elegance and finesse would be the best way to describe their wines. Envinate Taganan — Envinate was started in 2005 and is collaboration between four winemaking friends. They have been producing absolutely fantastic wines, focusing on the Atlantic regions of Ribeira Sacra and the Canary Islands as well as Almansa. Commando G La Bruja de Rozas — Commando G Viticultures comes from Spain just outside Madrid in Sierra de Gredos. Part of the new wave of young Spanish winemakers, Daniel Gómez Jiménez-Landi and Fernando García focus on Garnacha. Filipa Pato Nossa Calacario Bical — Located in Bairrada, Portugal, Filipa Pato has a rich winemaking history as the daughter of Luis Pato. She has been producing her own wines for some time now, staying true to the region and Baga grape.